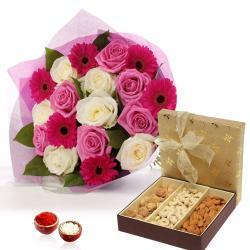 Product Consists : Bouquet of 15 Mix Red and Pink Flowers, 500 Gms Soan Papdi along with Free Roli Chawal. This auspicious occasion bring all the prosperity and good luck in your Brother life. 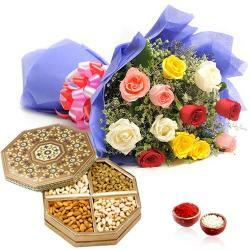 Wish Happy Bhaiya Dooj to with this gift combo it will be a wonderful way to touch your borther heart. 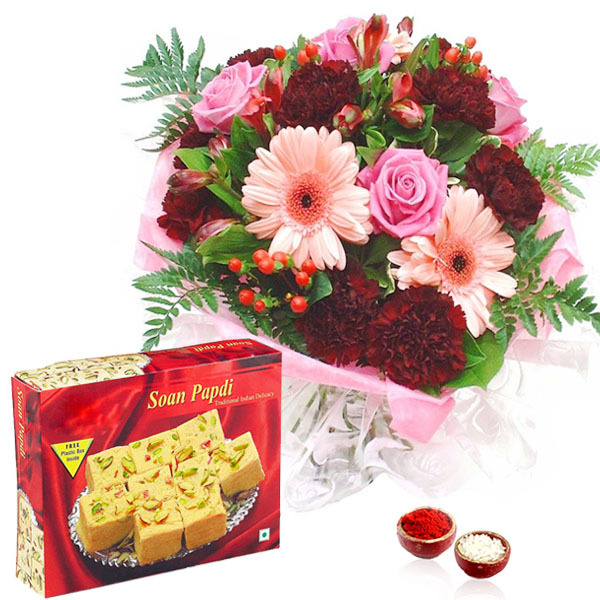 Beautifully presented Soan Papdi gift hamper is a heart winner. 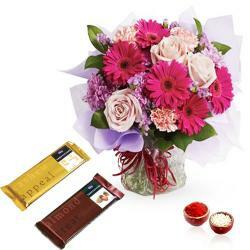 These beautiful and ravishing Bouquet of Rose, Gerberas and Carnation wrapping will never cease to amaze you with their beauty and splendor. Time has come for all Sisters to accept and express by gifting this items, it is an absolutely treasure of this marvellous realtionship journey which you have shared with your brother. It is so precious and when an occasion like Bhai Dooj comes along you wish to your Bhai for every happiness and pray that it lingers long. 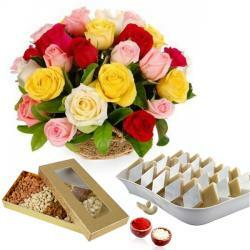 Gift this extremely delicious Hamper to your loved ones as an expression of your love on Bhai Dooj. Product Consists : Bouquet of 15 Mix Flowers in a cellophane packing with matching Ribbon bow tied, 500 Gms Soan Papdi along with Free Roli Chawal.